VietNamNet Bridge - Thousands of people packed Hanoi’s My National Dinh Stadium on the night of October 1, to shout “Westlife, we love you!” and sing along with their idols for nearly 100 minutes. After two rainy days under the impacts of typhoon Nesat, rain suddenly stopped on the afternoon of October 1, just several hours before Westlife’s Gravity tour. Thousands of fans flocked to the My Dinh Stadium to see their idols. Vietnamese fans had to wait for over a decade to see Westlife. Westlife appeared at 8.10pm, when a small rain began. However, the stadium was very hot. Thousands of people shouted “Westlife, Westlife, Westlife”. The band started the show by two songs “When You’re Looking Like That” and “World Of Our Own” in the shouts of encouragements. 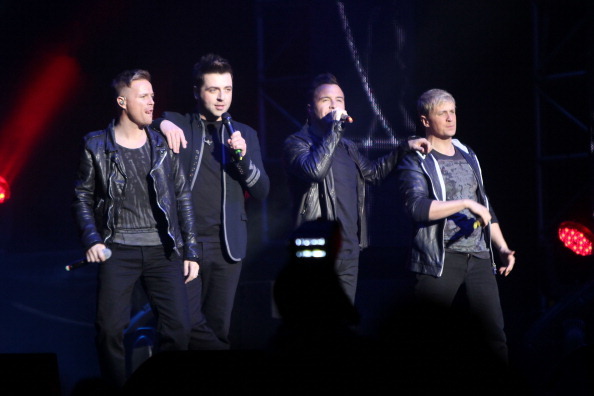 In the 100-minute show with over 20 songs, among those from the latest album, Gravity, Westlife also performed some hit songs that have brought the boy-band to the list of the world’s most popular artists, including “My Love”, “Seasons In The Sun”, “You Raise Me Up” and “Flying Without Wings”. The four singers - Mark Feehily, Nicky Byrne, Shane Filan and Kian Egan - made many young fans bursting into tears with their pieces of music and friendliness. Almost all the audience turned on the flash lights of their mobile phones after being asked to do so as the boy-band started to sing “You Raise Me Up”. The four singers also had a very close interaction with audience by shaking hands with them, and Nicky and Kian even helped their fans take the photos by using their own digital cameras. Kian also asked the audience to shout out “Twinkle”, the nickname of his future child - his wife’s second pregnancy, so that he can record the view for the child. Westlife kept the promise to their fans as not only showed off sweetest love songs, but also more exciting music with the cover of 5 songs, including Viva La Vida (Coldplay), Only Girl (Rihanna), The Time (Black Eyed Peas), Bad Romance (Lady Gaga) and I Predict A Riot (Kaiser Chiefs). Different with fans’ prediction, Westlife invited not four but up to eight fans, including two girls from Sweden and Denmark, to sing “Beautiful Tonight,” not “My Love” with them. They ended their Vietnam’s live concert with “What About Now” and “Uptown Girl”. The show closed by a firework show, which raised the audience’s temper to the highest level. The show marked a great leap in organizing technology in Vietnam. After the show ended, Nicky immediately logged on Twitter to share the 32-second clip he filmed the moment thousands of Vietnamese fans cheering up and singing along the hit “My Love”. The four-man idol group said they decided to add “My Love” to their list, although it was not originally included after finding out before coming here that the song was their most popular song to local fans. With their only one show in Vietnam, Westlife has really become “King of My Heart” in the heart of Vietnamese fans. Nearly 10,000 people watched the show. The band opened its show by two songs "When You're Looking Like That" and "World Of Our Own"
A fan cried when Westlife performed "My Love", a special gift for Vietnamese audience. Eight fans joined Westlife to sing 'Beautiful Tonight'. and I Predict A Riot (Kaiser Chiefs). ietnamese fans presented many gifts to their idols. The four singers also had a very close interaction with audience by shaking hands with them. Nicky and Kian even helped their fans take the photos by using their own digital cameras. Vietnamese audiences again in a near future.